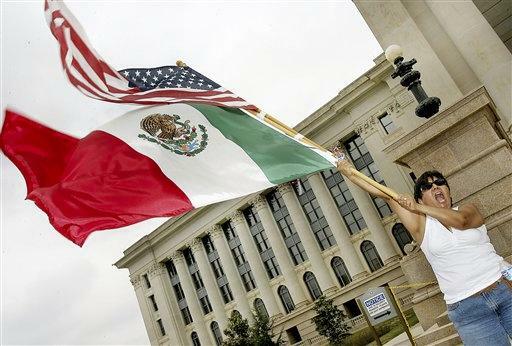 OKLAHOMA CITY (AP) - A state that has been considered the heart of America's Indian Country for nearly two centuries now has more residents who identify themselves as Hispanic than Native American, according to figures released Tuesday by the U.S. Census Bureau. While Oklahoma is likely to maintain the nation's largest per capita population of Native Americans, their numbers are shrinking and the Hispanic population is booming. "I'm surprised," said former state House of Representatives Speaker Larry Adair, chairman of the Cherokee Nation Gaming Commission. "I didn't realize we had that number of Hispanic people in Oklahoma." Oklahoma's history has been linked to Native Americans decades before it gained statehood in 1907. It is home to dozens of sovereign tribes, many forced to leave their homes and move west along the so-called Trail of Tears in the 1830s. It's also the birthplace of iconic cowboy and humorist Will Rogers, a member of a prominent Cherokee Nation family who was born in Indian Territory that later became the state. While the 85 percent population spike has allowed Hispanics to become the state's largest minority, the Native American population dropped from 391,949 in 2000 (11.4 percent of all Oklahoma residents) to 321,687 in 2010. Adair said it just proves Oklahoma continues to be a "melting pot." State lawmakers attempted to draw a majority Hispanic congressional district on Oklahoma City's south side following the 2000 census, Adair said.